I’m thankful for my husband and family who brighten my days. I’m thankful for my friends whose love and laughter make life more enjoyable. I’m thankful for my dear readers, especially those patiently waiting for the next novel. I’m thankful to you for stopping in to read my posts. 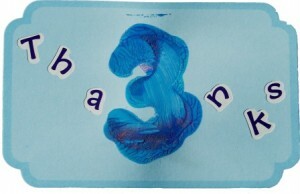 My daughter’s third birthday just passed and marked an exciting change in our thankfulness. She helped me make her “Thank you” cards this year. With a stencil, some paint, and letter stickers, we were able to make these note cards for each recipient. While making the cards, we talked about each gift she received and what she wanted to tell each person. I wrote her dictations, which were heartfelt and wonderful and sometimes a bit off topic such as, “I love watching birds.” But I like to think I’m instilling some thankfulness in her little heart. We teach our children to say “please”, “may I”, and “thank you.” But I see a few adults who need a refresher course on that topic these days. We all take our closest family and friends for granted once in a while, if not often. I hope this post can be a little reminder for us all to give thanks generously, mean it when you say it, and respond (appropriately) when you hear it. It warms my heart to hear a child say “thank you” and genuinely mean it. I think during these next few weeks, I’m going to pay extra attention to giving out plenty of genuine thanks! ← Goodbye 2011. Hello 2012!